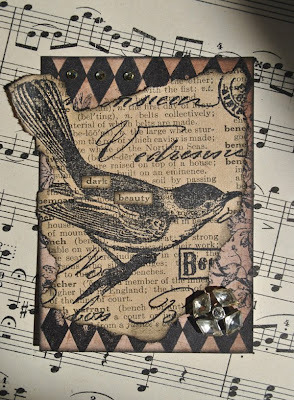 Artful Affirmations: Theme Thursday "Birds"
Fabulous - especially how the bird's tail extends beyond the edge of the ATC! WOW what a wonderful ATC. I love the bird ATC that you have made. Ohh what a wonderful atc!!! love your mix of elements! your atc is beautiful! Wonderful card, Terri! It makes me think of all the little singing birds that have migrated away from Finland - I miss them so much, but I know they will be back in the spring. Great ATC wren's are one of my favorite birds, so small yet so strong. Great atc.....I especially love the little flower in the bottom right hand corner.... it's just right! Dark? I don't think so. This is vey nice. Exquisite! This is such a gorgeous ATC. I love it. This is beautiful and mysterious. I love the touch of sparkle in the corner, it really draws the eye into the piece. Super ATC! Oh, i love this one!!! beautiful!!! Dark? oh my, dark is good! You did great!